Imagine your favorite spa or resort. Your favorite hideaway out of town. The place you go to relax, rejuvenate and recover. Now go back in time a few thousand years. 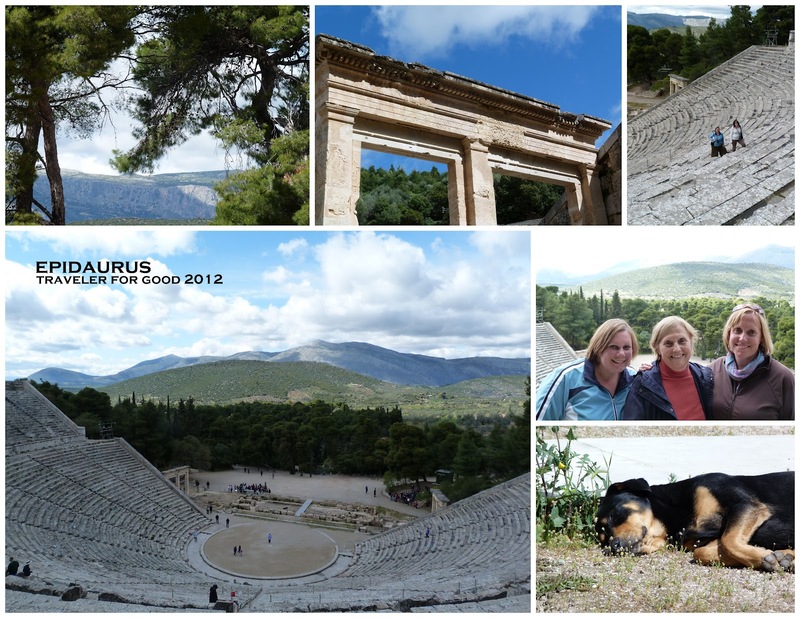 Welcome to the Sanctuary of Asklepios at Epidaurus. People would come here for 40 days of treatment for their ailments. And they wouldn't come alone. They would bring their entourage to join them in seeking a cure. Family, friends, servants. And the entourage would need something to do while the ill received their treatment. There were shops. Restaurants. Games. Debates. Theater. Mineral Springs. The most famous feature at Epidaurus is amphitheater which was covered by a landslide and is very well preserved. Acoustically the theater is amazing and all 11 - 15,000 people that would have attended a performance it its heyday could have heard every word. The theater is now the site of the annual Epidaurus Festival. Fortunately they don't cram 15,000 people inside anymore. Interesting theater fact #1: The rich were the ones who got the seats with the backs. Theater performances lasted all day. That's a long time sitting on a hard bench in the sun. Interesting theater fact #2: Theater lasted all day because it was a trilogy (a play in three parts with three actors standing reciting a well-known story) followed by a comedy. Since everyone knew the story, the entertainment came from the musicians and dancers who were in front of the actors in what we now would call the orchestra. Why is there a picture of a dog in the photo collage? I noticed throughout Greece that dogs and cats were everywhere, but appeared well cared for. Bowls of water and food would be outside. Snoozing in the Greek sun seems like a good life. This dog thought so.